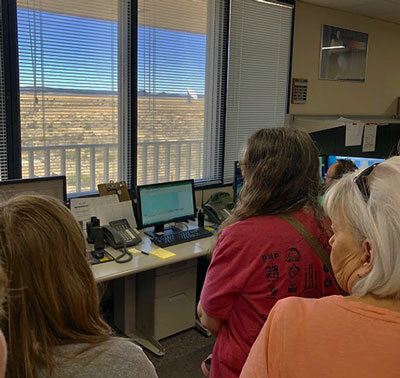 Last post we talked about how after learning more about radio astronomy at our OCA Astrophysics SIG, we decided on our goal of visiting the Very Large Array (VLA) Radio Observatory in New Mexico and in this post we can provide a brief summary of our visit there. But first we should review some of the mail and comments received from our readers. Next up, Science Squad and Gravity Guy, Ken, provided some feedback regarding axions and the search for dark matter. True, axions are very light weight, but this new speculative form that dark matter might be composed of, called Axion Quark Nuggets, would be quite heavy particles, in the microgram range. Wow, that pretty neat, and the really neat thing is that AQNs explain how the asymmetry between matter and antimatter can be resolved and why dark matter is about 5 times more prevalent than ordinary matter. There is not enough time here to go into this imaginative, but very speculative proposal, for which there is no evidence now, but stay tuned. Anyway, thanks for that Ken! Ok, now on to our visit to the VLA. You all have probably seen some image similar to the one below showing some configuration of the dish antennas that make up the array. The VLA is located in a remote and mostly radio quiet location about an hour drive west of Socorro, NM. The VLA was built in the 1970's and has just been recently upgraded with newer electronics and after the upgrade is often called the Jansky Very Large Array, after one of the early radio astronomers. With these upgrades the VLA can observe over the 1 - 50 GHz frequency. Since radio waves at these frequencies are not impacted much by the atmosphere and dust in the universe the array can provide details about galactic structure that optical observations cannot see through. 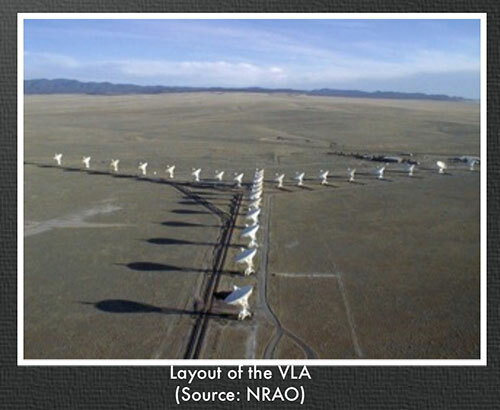 The VLA can be arranged in four different configurations, A through D, in which the 27 identical dishes can be grouped together in a tight Y formation of about 0.6 mile diameter or spread out in a very wide Y formation of about 22 diameter. Most of the time all dishes are directed toward the same target but in some instances the array can be split up and different observations of different objects can go on at the same time. One of the best examples I've seen for why all four configurations get used in the study of one object is this study of the Hercules A galaxy. The very wide A configuration can get very high angular resolution of objects and the other configurations can achieve more and better degrees of sensitivity. Check out how these four different perspectives on Hercules A show different levels of detail. Finally, when the results of the four configurations are brought together in one image and overlaid with optical images you get a very impressive view of Hercules A. 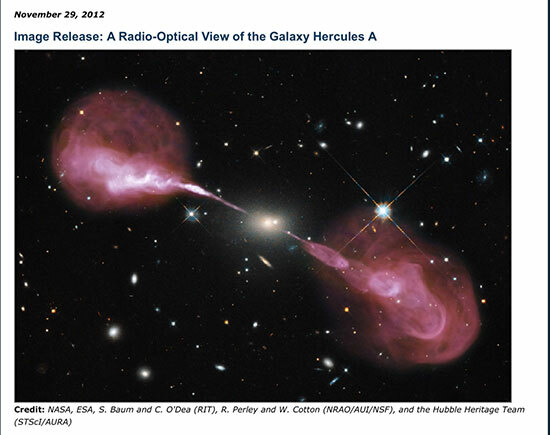 Without radio astronomy the jets emerging from the galaxy would not be visible. 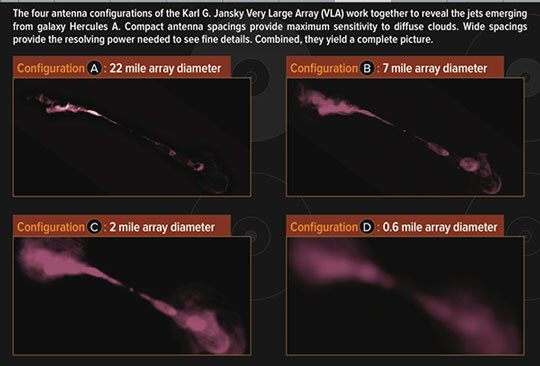 We can't show these great images made with the help of the VLA without talking a little bit, at least, about how the array works as an interferometer and how all of the 27 antennas are interconnected to collect radio light from distant objects. 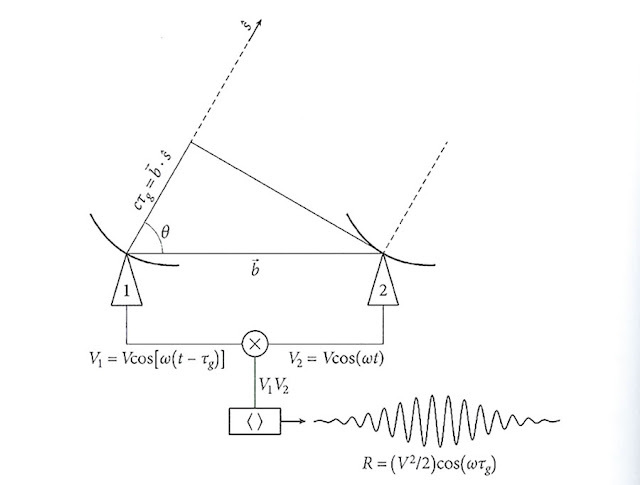 Hmmm, this could get a bit technical and mathematical, but we can't just ignore it so let me try just one diagram that I have been studying in my radio astronomy textbook. The interferometry and correlation science is much more detailed, but I think this one diagram will start to show what is involved. This diagram jus shows two dishes but the key thing about correlation of radio signals from all the antennas can be compared and correlated in the same way. The distance between any antennas sets the baseline distance and this distance results in incoming signals from some object to arrive at slightly different times at each antenna. The correlation of these signals, done with a supercomputer correlator at the VLA, is essentially a multiplication and filtering of the two signals, which shows up as the squiggly signal that rises and falls in amplitude as the two antenna signals move in and out of phase and alternatively result in constructive or destructive interference. 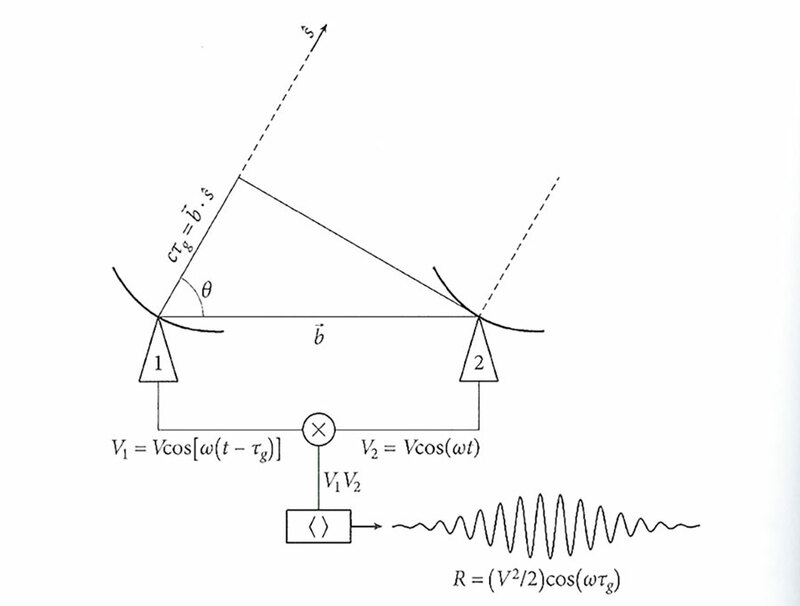 As the antennas track the object across the sky, the time delay between the two objects naturally changes as the angle of elevation changes. This correlation of widely separated antennas allows the VLA to achieve very high angular resolution, down in the milli-arcsecond range. Whew, ok, enough of that and if you want more check out the referenced textbook! 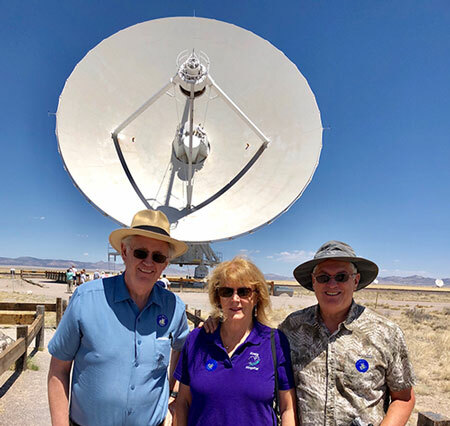 So, to find out more about the VLA, I met up with Science Nerds and Theatre Impresarios, Scott and Sandy, and we made our way from OC to Albuquerque to Socorro and finally to the VLA. Here we all are trying to make our way over to one of the closest dishes near the visitor center. The visitor center has a gift shop and is the starting point of guided or self guided tours. They also show a great introductory video of the VLA and how it all works. Of course, they chose Jodie Foster of "Contact" to be the narrator. As we approached this big dish, it obediently slewed around to face us, not because of our specialness and a desire to pose for us, but it just happened to be direction to its next target. When near the dish, you can hear he drive motors and gearing and also the air conditioning and cryogenic cooling systems doing their thing. Even after it got to its commanded position, it still had to keep tracking to compensate for the Earth's rotation. 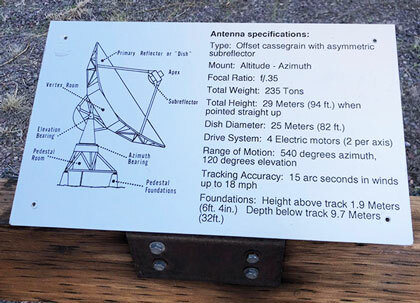 There is a plaque near the dish that lists some of he significant antenna specifications. We also had a guided tour of the VLA control center and correlator. You can see one of the dishes outside the control room window. During our visit the array operator had to interrupt his description of the facility in order to launch a calibration command. The VLA is highly automated but the operator still has to verify that the right sequence of scripts is being implemented and the correct number of antennas are online and ready to go. For calibration, all 27 dishes are pointed to the same deep space object, like a quasar, and if they are all pointing at the same object then their output readings should all agree and/or be tuned to agree. The VLA observing schedule is such that each of four configurations has a four month term after which the next configuration is chosen for the next four months. This offset in the calendar year means that each configuration rotates through the calendar and all parts of the sky will be eventually covered. Of course, the VLA can operate 24 hours per day and does not have to wait for dark to begin observing. Sometimes heavy winds will interfere with observation and the dishes have to be placed in a wind safe mode, which is essentially just pointing straight up. So, you might be wondering how these giant 235 ton dishes are moved around into the four configurations. Well, as we drove out to the VLA, some legs of which cross the highways, you could see that the antennas in the Y pattern are aligned with railroad tracks and the dishes can be moved along the tracks and then parked on the side. They have a specially built transport locomotive type machine that lifts up the 235 tons and moves it around on the tracks until it gets to the right location and then it rotates 90 degrees and moves off along perpendicular rail tracks to the final antenna parking position. If a given dish needs serious maintenance it can be brought back to the maintenance shed without interfering with the positions of any of the other dishes. When I say the railroad tracks crossing the state highway, I said, hmmm, what they need here is a sign, sort of like "deer crossing" or maybe more appropriately for that New Mexico location, "antelope crossing" or similar sign? 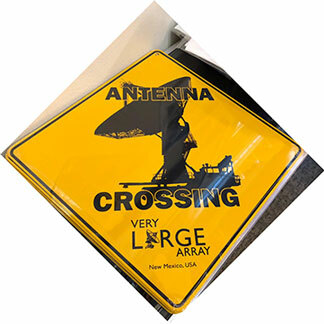 But no, there was no sign there, but the gift shop did have "Antenna crossing" signs there for sale. See below. So the array stretches across some of the state highways and we, at least as I recall, did not see any sign about turning off our cell phones until we arrived at the visitor center. Our tour guide told us that a cell phone on the moon would be seen to be brighter (and later I went back and calculated a rough order of magnitude of about 1 billion times brighter) than many of the deep sky objects that the VLA observes. 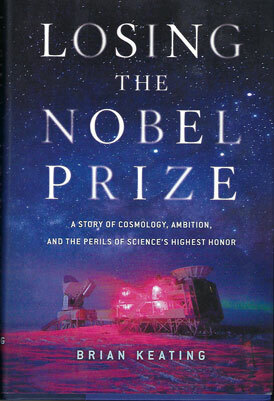 This got me thinking about a recent UCI Physics Colloquium and book signing where Brian Keating spoke about his new book on losing the Nobel prize and how the BICEP2 team had to withdraw their published finding of gravitational waves originating at the big bang. If they had to withdraw their paper due to not having the correct dust contamination model, what if some VLA discovery was being corrupted by cell phones? Maybe it was the long straight country road to the VLA or the sun glare in my eyes or something, but I couldn't help but imagining some VLA researcher cursing, "Darn, I could have won a Nobel prize except for all of these tourists and their cell phones." Well, maybe not, but check out the book if you want to hear more about trying to win the Nobel and about some advocates who think the rules of winning need to be updated to account for the thousands of scientists that now work as giant teams. Thanks for the signed copy, Professor Keating; now I just have to find time to read it. Well as long as we were in the dark skies of Socorro, NM, I just had to try to get at least one DSLR image of the Milky Way, which was up and visible from about 12:30AM to 4:00AM. I had set the alarm for about 4 AM and went to bed, but work up about 1:30AM, so I just grabbed the camera and went outside the hotel for a quick little peek at the night sky. I didn't have a tracking mount, so I couldn't go deeper than about 1 minute exposures, but I could select either my 10-18mm, f/5.6 lens or a narrower field of view, 14mm, but larger aperture, f/2.8. The parking lot lights were a bit brighter even in the furthest corner that I like and the images I took had circular interference rings of light that bounced off the lens. Hmmm, what to do? We probably should have just driven a mile or two away and got away from all the lights, but I found that I could mostly just use a parking lot tree to shade the most glaring light. 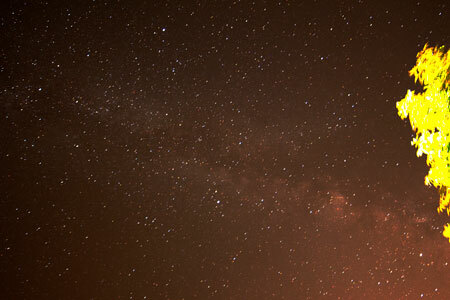 So, I had to be content with Milky Way image below. Next time we will drive away from the hotel a bit. Ok, that is the summary of our trip and tour of the VLA in New Mexico. We had a great time. Thanks for everything, Scott and Sandy, it was a lot of fun! Sadly, the other Resident Astronomer, Peggy, could not join us on this adventure because of her big wonderful, warm caring heart and desire to help Sister-in-Law, Joyce, recover from her heart surgery, so she stayed behind. By the way, for those wondering about my last post where I mentioned the sub goal of going to this location in New Mexico, was to sample the local margaritas and get some sopapillas. Well, the margaritas were sampled and they were pretty good, in fact, the menu described them as "Perfect Margaritas" and I guess we can't disagree so yes, they were perfect margaritas. Now as to the sopapillas, we could not get on the right schedule or restaurant to get any so we will have to keep that as a goal during our next visit to the VLA or New Mexico, the "Land of Enchantment." The next event on our schedule is the International Space Development Conference 2018 (ISDC) in Los Angeles on May 24-27. They have a great lineup of speakers and sessions. See everyone there!